thebakerwhocooks.net | What a find! This will be one of the rare posts where I don’t really post up pictures of food. But I trust you will find it intriguing nonetheless. 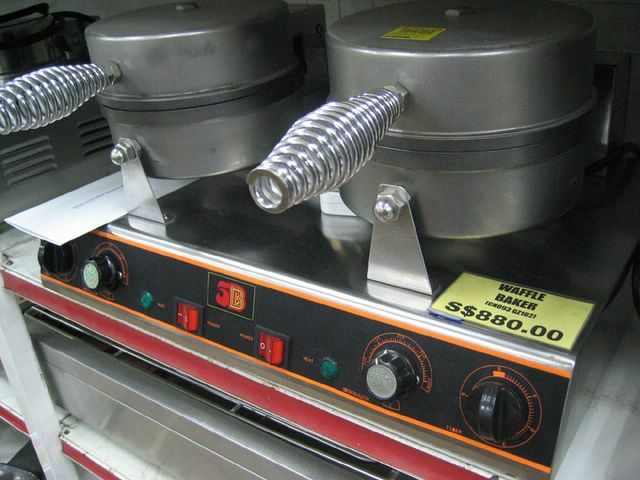 I was actually walking along Joo Chiat road a few weeks ago and I came across this huge shop selling household items, baking equipment and machines you only find in cafes, restaurants and eateries! Okay, I know it’s not that big a deal but well I haven’t seen a shop selling these machines per se so I was quite tickled that I had to take pictures. They had price tags too. Now I know how much they cost so at least, I can prepare myself for my own bakery/eatery in future… haha..
I’m sure you’ve seen this most often at hotdog stands. 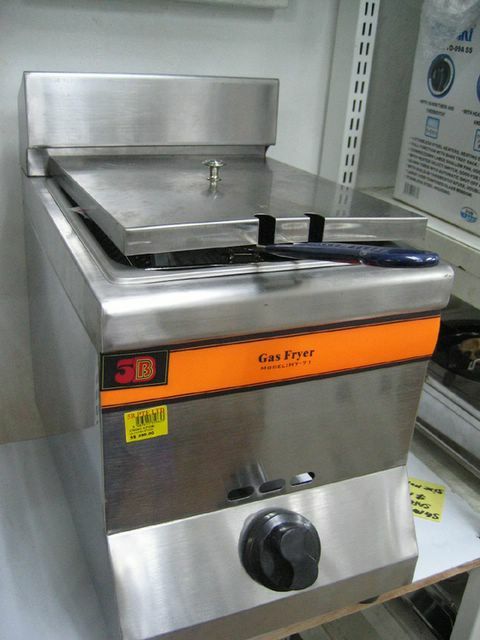 This is what they use to keep hotdogs warm. 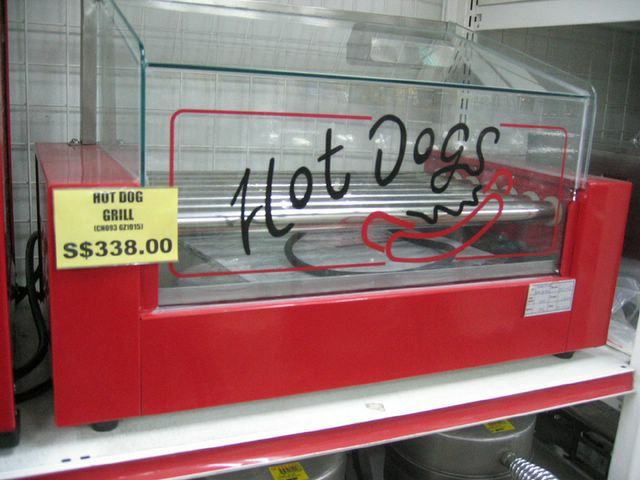 The aluminium rods roll continously to ensure heat is distributed evenly throughout the hotdogs. Cool, no? Recognise it? 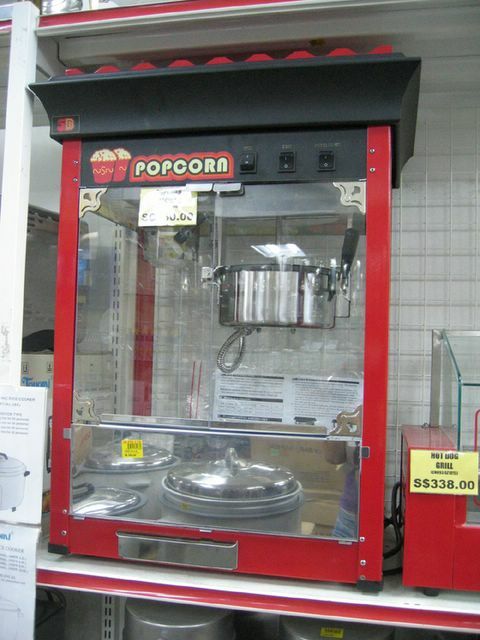 So if you love love love popcorn, why not just get this huge machine? You can invite your friends over and have a movie marathon too. It costs about SGD $338. Gone are the days where you have to heat your oil to the right temperature in the pot in order to ensure the corn pops properly. Fancy having a chicken-wing party? You’d love having this machine at home. It’s H-U-G-E. But scary too… imagine how much oil it requires. Sorry, but i’m not really a fan of deep-fried food. The thought of murky brown oil just irks me so. 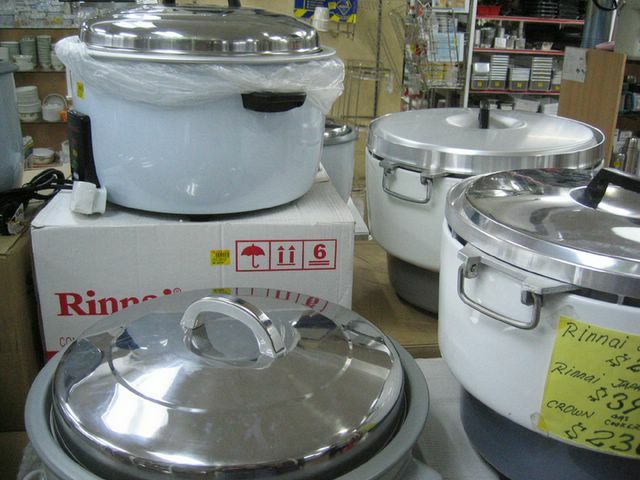 Last but not least are these giant rice-cookers! I’ve always wondered how those coffeeshops manage to cook so much rice. I think they must own one or two of these. One pot is enough to feed more than 20 people I should think! Even 50? You never know! I really enjoy discovering interesting shops like this and just when I think Singapore is so small and predictable, things like this prove me wrong. I do suppose I have yet to search deep into the heart of my homeland. Joo Chiat is a really nice place to eat yummy food and find shops like these! I pop popcorn in the microwave. All those ready-made just pop in and set it to 5 minutes kind of popcorn. :p Fast, easy, and best accompanied with a good video. haha…Yah.I still have 2 packets of those ‘microwavable’ popcorns at home… super cool to see the packet expand!! THese machines really reminds me of some game when we earn enough pts to upgrade machineries! When u do open ur own shop..Invite me over! Or i can go work part-time on wkends! haha..
Have you heard of Sia Huat? If you haven’t, you ought to check it out. You’ll love it there. It’s along temple street. Take a train to chinatown, and walk the temple street, where mac donalds is next to. Hi I’d like to know the address for this place in Joo Chiat. I’m looking to buy a popcorn machine and was initially told that Sia Huat may have it. Would you have any idea where if Sia Huat has such popcorn machine too? Looking forward to your reply. Many thanks in advance. oh dear, I don’t think I have the address for this place. i haven’t been there in a long time. if i remember correctly, it’s nearer the end of Joo Chiat Road which leads you to the geylang serai area. Not sure if Sia Huat has it. Maybeyou could call them up?